Is it just us or does anyone else hear Eddie V.'s amazing solo on Van Halen's Jump every time you read about T-Mobile's new upgrade plan. Just because the one-time successor to Eric Clapton is now best known as Valerie Berinelli's ex doesn't diminish his accomplishments on the six-string. 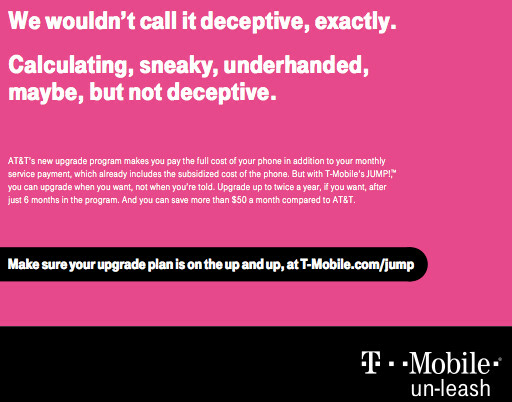 Meanwhile, T-Mobile is taking it to AT&T again on Tuesday, with a full-page ad in USA Today calling AT&T's Next upgrade plan calculated, sneaky and underhanded. If you're not sure what all the talk is about, it seems that AT&T is making you pay twice for a new phone that you don't even get to keep. We pointed that out last Tuesday. AT&T's plan has you continuing to pay a monthly service price that includes the subsidized price of a phone that you are also paying monthly for. 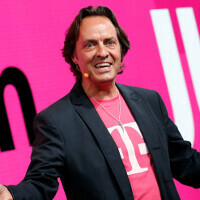 Last Tuesday, in a tweet, T-Mobile CEO John Legere related how he couldn't believe that AT&T didn't cut its service price to account for the monthly payment you are already making on the handset. The executive quickly become one of our favorite hashtag wits by tagging his tweet #asktheschoolkids, making fun of AT&T's widely seen television commercials. AT&T is probably not going to take this lying down, so you can expect a response from the nation's second largest carrier soon. Getting the new iPhone is not nearly enough to make T-Mobile pass either of those two, and especially not Sprint. The price difference between all the carriers only varies from 5-15 a month depending on your plan. If you don't need unlimited data (like 95% of Americans) Verizon or AT&T are your best best. If you need Unlimted, T-mobile will most likely be your choice. Sprint's network is a Joke. The only possible for tmo to pass those two you mention is to explore their network in urban and in rural area. i agree with you, 8 years ago sprint coverage was terrible, but to say 'T-Mobile will never surpass them in network or customer' is just TOTALLY WRONG! just because you thinik tmob has not currently surpassed sprint today, does NOT mean it wont ever happen ! And I for one hope it works. The big two have been aggressively pushing the price envelope for too long - they could use a little heat, IMO. Hey, tmo....slowdown! remember, at&t is 2nd biggest carrier and almost all flagship phone you can find are from them. Just continue improving/exploring your services and network. Good luck...tmo consumer! doesnt matter how BIG they are or not! if your not under contract with att or verizon, then why are you paying $20 amonth? its because your a stupid idiotic consumer, DUH DUH DUH DUH ! ...program makes you pay the full cost of your phone in addition to you monthly service agreement... ...in addition to you (not your) monthly service? I think I just found a spelling error in there. I hope they fix it before publishing it. You just may be the one who wants to check your(not you) statement for spelling errors because they did spell it correctly. They are talking to the customer in second person lol. I'm sure they put the ad through extensive checks before publishing. Sounds like we have a want-to-be professor on our hands. Don't you know that common errors such as this one slips past editors all the time? News paper articles as well as some text books have this kind of error from time to time. I hope you know that when using the personal pronoun You to show ownership (in this case monthly bill), it becomes your. One should never say "YOU Monthly bill is past due so YOU account has been suspended." Heads up, kid, you may not be as smart as you think. It's 2013, my friend, education is a great thing. Signs of desperation I say..
How? The AT&T Next program is a rip off. Most tech blogs have done the math for the consumer. Seems T-Mobile is just calling a spade a spade. No desperation, just making fun of a giant bending their customers over. I am switching to tmo when the new iphone comes out. I am tired of AT&T greedy practices. AT&T doesn't have to respond so "soon" may never come. More important, I think of House of Pain's "Jump Around" first, Van Halen's "Jump" second. Let's just say that the additonal price that AT&T customers are paying for is for the network coverage service that they are getting. I mean, there are still areas that T-Mo does not cover. But as of the moment, T-Mobile is on the right track for providing an exceptional Customer Service. For the customer experience, it's getting there! Coverage quality is completely beside the point. Their already too-expensive price more than sufficiently paid for the better coverage. With their new upgrade program you're paying even more yet your coverage remains the same. I love this guy!!!! Calling AT&T out like they should be. Come on T-Mo we need better coverage in rural Louisiana, and I will join the PINK! Maybe if TMo had more than more than 19 towers, I'd give them a try.